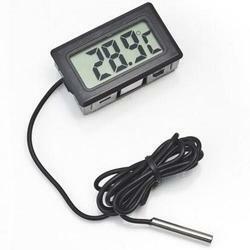 - Heavy duty and all in one pen type thermometer. - Meter can default the measuring unit to or . - Two type display, normal or reverse, easy for operation. 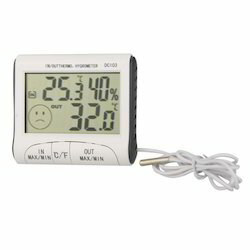 LCD Portable Digital Thermometer, we provide excellent quality LCD Portable Digital Multi Stem Thermometer to our customers. An infrared thermometer is a thermometer which infers temperature from a portion of the thermal radiation sometimes called body radiation emitted by the object being measured. LCD Gauge is a micro controller based parameter indicator using Circular LCD bar graph. It not only measures but also compares the parameter value with factory set value to flash an inbuilt LED and to give out open collector output. Available to indicate pressure, temperature & level etc. Extensively used on Dash boards of heavy vehicles. pvc sucker at the back of the unit.